For the second consecutive earnings report the stock of Angie’s List (NASDAQ: ANGI)has soared over 30%. Is this due to irrational exuberance or a change of fundamentals at the company? Only a month ago this article theorized that airlines might finally be investable. Fortunately both Delta Airlines (NYSE: DAL)and US Airways Group (NYSE: LCC) obliged the theory by reporting strong Q1 earnings. A quarter that is typically the weakest actually turned solidly profitable for two of the market leaders. In fact, Delta claimed the highest profit in over a decade. The rumors are always ripe in the Verizon Wireless saga between 55% owner Verizon (VZ) and 45% owner Vodafone (VOD). The news has gone from a Verizon buyout of Vodafone's share to buying all of Vodafone and now back to buying out Vodafone's share. The latest news leak is that Verizon has hired advisors for a bid of $100B for the Verizon Wireless stake. Could Vodafone with a $150B market cap really receive a $100B payout on its 45% stake? Actually the data suggests the value will be 20-30% higher. While performing research for an article on Netflix (NFLX), the constant discussion on original content made me wonder about other content generators. Especially when considering the massive valuations of entertainment content companies. As an example, nonfiction content creator Discovery Communications (DISCA) has a market value of $28B and The Walt Disney Corporation (DIS) is worth $111B. Is it possible for user generated content to ever create companies of that size? All of those firms are vastly different from a focus of distributing content in the case of Netflix to the creating content for a vast network of cable channels at Discovery to creating films and TV shows at Disney. In general, all of the companies are involved in the creation and distribution of entertainment content that has historically had significant value creation. After the close on Wednesday several technology firms reported earnings with vastly different stock reactions. In the tech world, earnings season tends to be a moment of wild swings. The stock reaction can be nothing more than expectations getting out of hand and investors turning too bearish or the result of a shift in the business fundamentals. Either way, the moves highlight the problems with investors getting too bullish or bearish as most stocks tend to eventually revert to the mean average. In the after hours action, investors got a prime example of what happens when a market leader makes a move in one direction. The likelihood exists that the stock will revert to the mean eventually and no better time exists than an earnings report. This exact scenario occurred in the earnings reports for Akamai Technologies (AKAM), Equinix, Inc. (EQIX), and Fusion-io, Inc. (FIO) on Wednesday night. As natural gas prices soar this year, Chesapeake Energy (CHK) is likely the biggest beneficiary. The heavily indebted, asset rich firm will make out like a bandit if natural gas prices triple as Jeremy Grantham suggested earlier this month. As Chesapeake was its own worst enemy with an aggressive land acquisition and drilling plan over the last decade, the company might become its own best friend with a scaled back capital spending plan. After a decade of rapid growth, Chesapeake turned into the largest independent producer of natural gas and a leading landholder in the vast majority of the important shale areas. The company has a leasehold on 15M net acres and has a reserve base of nearly 20 Tcfe. While the stock has been very volatile today, the news on the new capital program was very bullish. The news on the earnings front were mostly inline with the recent expectations from the market. The massive new capital return program blows away any previous programs in the markets. Apple (AAPL) announced plans to utilize around $100B of cash in the program by the end of calendar 2015. A plan that we suggested the company implement just a few days ago (see Apple: Time To Unleash A Massive Buyback Program). The details include approving a 15% increase in the quarterly dividend to $3.05. The increase jumps the dividend up to 3%. The company will now spend $11B on these annual payments. The biggest move though was the increase in the repurchase authorization to $60B from $10B. Disclosure: Long CJES & HEK. Please review the disclaimer page for more details. Disclosure: Long CSX. Please review the disclaimer page for more details. 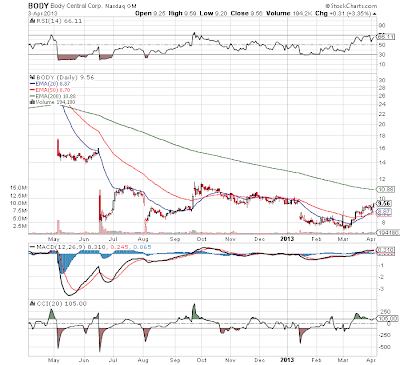 After reading the quarterly report for Peabody Energy (BTU), one has to wonder if the coal supercycle is back. A few years back the CEO proclaimed that coal had begun a long-term surge in demand yet the stock began a major slump as new mines and higher costs caused profits to plummet. As US investors remain focused on last year's domestic switch to natural gas from thermal coal, the global demand for coal remains as strong as ever. One major theme highlights the global demand picture for coal. Where alternative fuel prices are cheap, consumers prefer that source whether natural gas, nuclear, or alternative fuels. In the cases where alternatives don't exist or are no longer deemed appealing, coal demand is set to grow dramatically. The situation in the US is incorrectly framed as a preference for a cleaner alternative to coal, but the scenario might see a dramatic shift as natural gas prices soar in 2013. After the market close on Tuesday, Yahoo! (YHOO)reported Q1 2013 results that provided limited progress at growing the business. The company has been busy updating main products such as the home page and mail yet it hasn't led to expanded revenue, adjusted EBITDA, or operating income. The consumer internet company continues to struggle in attracting the current generation of internet users focused on social media and attached to Google (GOOG) search. Yahoo! though has been able to dramatically increase the earnings per share based partially on the share buyback program and the exclusion of stock based compensation (SBC). Oddly the SBC number wasn't excluded in prior periods unlike other technology stocks. The company shared that engagements had increased on updated products, but clearly those numbers aren't flowing to the top or bottom lines. The Top 5 stocks had a huge month after a weak February. Seagate Technology (STX) and DirecTV (DTV) had huge gains in March that easily offset the substantial 5% losses in February. DirecTV had a smashing 17.5% gain followed by 13.7% for Seagate. WellPoint (WLP)followed the February loss as well, with a 6.5% gain in March. Both Motorola Solutions (MSI) and Kohl's (KSS) also had small gains, though smaller than the 3.8% gain of the S&P 500. Anybody following previous articles on Nuance Communications, Inc. (NUAN) knows that the company and stock have been incredibly appealing, yet the scenario never existed to load up on the stock. The company has had a decent growth profile and it has compelling technology, yet the combination hasn't lead to stock returns over the last 18 months due an over reliance on mergers and the accumulation of debt. 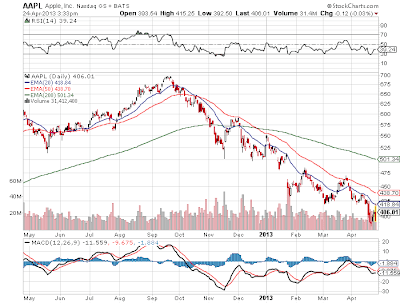 Nuance is famous for being the technology behind the Siri product used by Apple (AAPL), which recently hit 52-week lows. Ironically within the same day reports of two potential catalysts hit the wires that could push the stock higher. Another quarter and another major buyback by American Capital, Ltd (ACAS). The company announced it has now repurchased 61.4M shares since shifting from paying dividends back in Q3 2011. The total buyback has amounted to $623M over the last 7 quarters at an average discount to a continuously soaring NAV of nearly 40%. Nonetheless, the stock continues to trade at a substantial discount even after demonstrating to the market every quarter that it has the financial ability to spend that much cash. Don't look now, but Body Central (BODY) appears to have hit bottom. After the huge plunge last Spring, the stock has spent the last 7-8 months flat lining. Now for the first time since a false attempt in September, the stock has moved above the 20/50EMAs. Have the fundamentals really changed? Analysts have cut the Q113 earnings estimates from $0.34 90 days ago to only $0.18 now. The stock is signaling a potential change in the air. With the 52-wk high at $30.93, BODY could be a sweet gainer if the turnaround is complete. Just not convinced it is in the bag yet. Document Security Systems Setting Up For Huge Gains? After our last writing about Document Security Systems, Inc (DSS) in late December, the stock dropped to new lows at $2. Considering the shift of the patent case to California, it isn't too surprising that the stock has limped along. The previous documented success of VirnetX Holding Corp (VHC) and Vringo Inc. (VRNG) only occurred after those stocks had initial progress in their patent cases. DSS is a leading developer and integrator of cloud computing data security, Radio Frequency Identification (RFID) systems and security printing technologies that prevent counterfeiting and brand fraud. After the trading week closed on Thursday, March 28, Prospect Capital Corporation (PSEC) made a surprising announcement that the company had originated a record $800 million during the March quarter. The surprise comes after the company claimed in early February that the originations for Q1 were a mediocre $141 million almost halfway into the quarter. The market didn't actually expect much following the year-end push to exit businesses to beat the tax deadline. Prospect Capital is a leading provider of flexible private debt and equity capital to sponsor-owned and non-sponsor-owned middle market companies in the United States and Canada. It trades as a closed-end investment company that has elected to be treated as a business development company (BDC) under the Investment Company Act of 1940. With dividends and high yields in vogue these days, investors need to be careful that they don’t overpay for these stocks. Some of the stocks have performed so well over the last couple of quarters that their share prices have surged 30-50% during that time period, which is odd for multi-billion dollar consumer goods and insurance stocks. Disclosure: Long CB and TRV. Please review the disclaimer page for more details. As investors might remember, back in mid-February CenturyLink, Inc.(CTL) did the unthinkable at the time. The company slashed the dividend in order to better allocate cash and implement a more flexible stock buyback plan (see Did CenturyLink Just Become A Gold Mine To New Investors?). The mega-cap stock plunged 26%, which is unheard of for a stock that still maintains a market cap of $22B. As cooler heads prevailed, the third largest telecommunications provider in the U.S. has rebounded sharply from the initial lows below $32. At the current price over $35, savvy investors have already made 10% from those first day lows. With a 47% gain on the first trading day of an IPO, it's difficult for any stock to gain in the after market. Industrial 3D printer ExOne Company(XONE) is attempting to be the rare exception after impressing investors with strong guidance for 2013. The stock surged nearly 10% in trading on Thursday following the announcement. The company that focuses on manufacturing and selling 3D printing machines for industrial customers only sold 8 machines for the quarter making it difficult to develop a long-term investment thesis. Due to the late date of the IPO, the company is just now reporting the Q4 numbers at the very end of Q1. With the quarter virtually over, the 2013 guidance should be very solid at least for the first half of the year. Should Investors Stick with Adobe While Insiders Are Fleeing? Last week, Adobe Systems (NASDAQ: ADBE)reported earnings that easily surpassed estimates, sending the stock to new highs. So why are insiders selling shares at alarming rates while the CTO is exiting stage left?